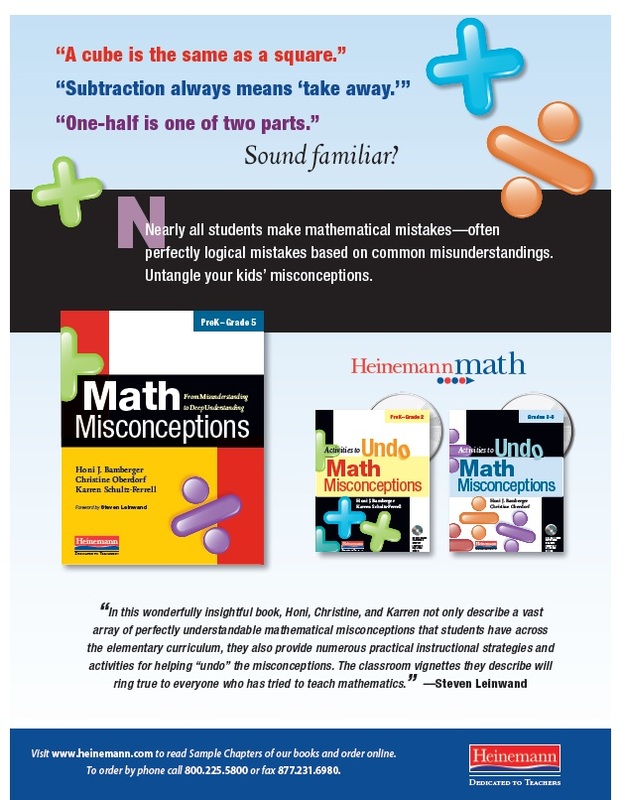 Just a quick note about a wonderful session at a conference I attended today called "Activities to Undo Math Misconceptions". It was based on a book by Honi J. Bamberger and addressed the math concepts of money, time, counting, fractions, place value, and equality in K-3. The best idea I saw all day was a way to help kids understand coin values! 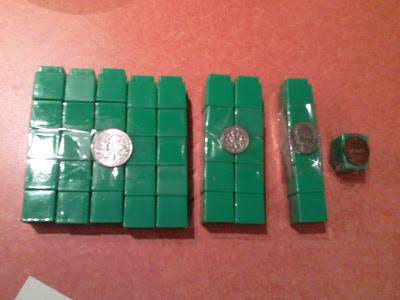 You can use unifix cubes and a hundreds board to really drive home the understanding that different coins have different values. What a great idea! I can't wait to try this next year! I love the cubes/ coins idea! Coin value is such an abstract concept for kids to understand so I think this makes it more concrete and visual for them. I recently found your blog and decided to give you the One Lovely Blog Award. You can stop by my blog to receive it! We haven't gotten to money this year, so I haven't had a chance to try this yet. We did discuss the importance of each student making their own model, then placing the models on a hundreds board to see the amounts in relation to each other and to 100 cents. I may have to convince my principal to buy this book so I can read more! Thanks for posting; re-posted it to my FB fan page-I'm a former teacher & getting kids to understand the money concept from an early age is great! I think this concept could be taught at home with Lego's. I like the Lego idea! Great idea. 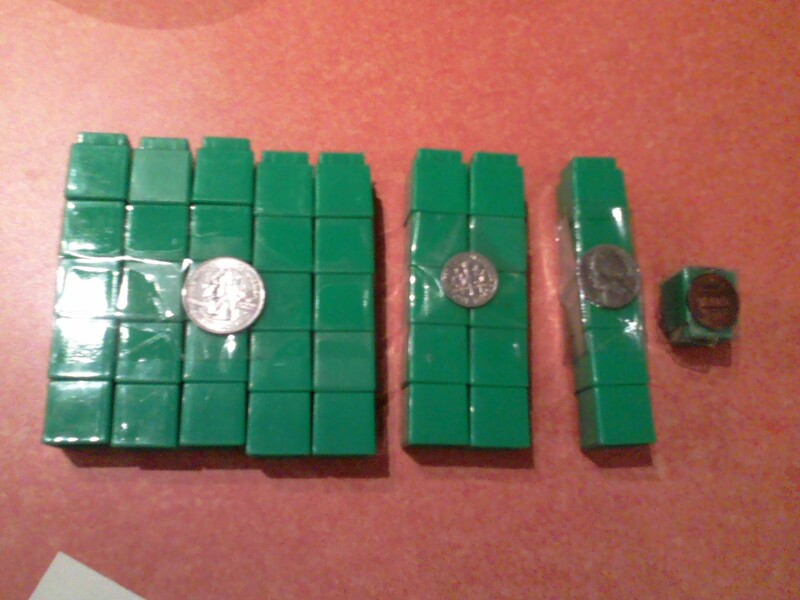 We also use Numicon to reinforce value of coins. I've never heard of Numicon. I just Googled it and it looks intriguing! Thank you for sharing! I love visiting your blog!!! Hello! I am unfamiliar with all of this blogging and found your blog by accident. I LOVE IT! You automatically struck a chord with me! I also have 3 sons, my youngest is autistic, and am in my 40s. I teach kindergarten in Virginia. You have wonderful ideas shared here and I'm so glad to have found you! Best wishes and thank you! If you're close by Richmond, keep in touch - sounds like we have a lot in common! Could you share the name of the conference you attended?